Whether we can give actual details to the forums ? To share what I've learned ! Network related development, Advanced Routing(OSPF, BGP) related topics and Cisco related posts will be published. After the release of the rootkit.com whole Mysql database (http://stfu.cc/rootkit_com_mysqlbackup_02_06_11.gz) 85000 users detail (if we remove the duplicate at least 50000 users) I searched my data obviously listed there.. :( Anyway i used to rotate my passwords and use lame passwords in the forums i feel safe. But after the breach the owners could advise the users of the group may be they don’t have the data now ? Some of the hashes i could reverse. I searched some Sri Lankan users around 30 users i could reverse some of the users password obviously my one too as reference ;). Hope dedicated crackers could use large rainbow table to reverse more of it I don’t wont to waste my time. 384 - password is "password"
329 - password is "rootkit"
This vulnerability basically WebDav can be access like ftp server if you know the username & Password. since Xampp places the default username & password the user doesn't restrict the access to xampp directory after the xampp installtion attackers can places their files & execute remotely. they can use your PC to DDoS their targets. Quite a strange my machine generating 80Mbps traffic towards one of the host. as usual i searched through process explore (sysinternal ) for any unwanted process + tcp connection, Nothing suspicious.But Anti-Virus logs points out http.exe trying to access IRC ports http.exe is xammp apache server process. mikrotik queue tree - Per connection queuing. 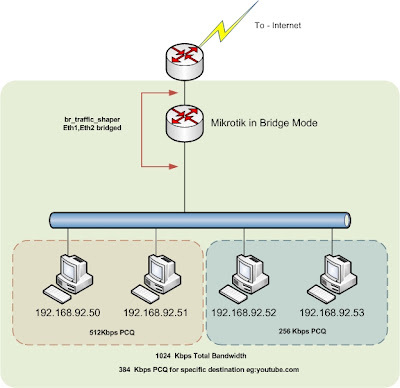 One of the cool feature on Mikrotik queuing is Per Connection Queuing . we can equally distribute the bandwidth among Number of users. This setup explores the per connection queuing in the congestion situation and how to utilize the priority queuing features. In this test setup 192.168.92.50 and 51 given 512Kbps per connection queuing(PCQ) Priority 6 . 192.168.52 and 54 placed under 256Kbps PCQ (Priority 8) and further youtube users given 384Kbps irrespective to the queue they are currently placed ( FIFO) . 1) Bridge setup - " Don't forget to enable the bridge firewall :) "